What do Philadelphia and Ypsilanti, Michigan have in common? Both cities have barbershops that are giving discounts to children who read to the barber during their haircut appointment. Inspired by the recent news of a barber in Michigan giving discounts to kids who read to him, Jazz the Barber of Creative Image Unisex Salon is a Words at Play Community Partner and hosts a Book Nook in his busy barbershop on Cecil B. Moore Avenue. He started offering free cuts to children 6 years old and younger on Wednesdays when they read a book in the barber's chair. Words at Play also wrapped up their most recent Play Party Series at Widener Library in October. Families played with their food, learned what animals eat, and made art and music with food. 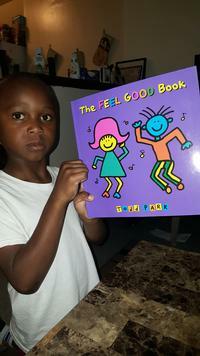 Children took home some new books and resources to work on building their vocabulary at home. Check out these October Play Party books with a Food theme at your neighborhood library! The next Play Party Series will be held on Saturdays in December from 11:00 a.m.-.12:00 p.m. at the Cecil B. Moore Library, where we’ll continue with our theme of “food.” Subscribe to our newsletter to learn more about upcoming events and hear about all the great things going on in our North Philadelphia neighborhoods! Maurice shows off a book he got at the September Words at Play Block Party. Jazz the Barber reads to some children at his business, Creative Image Unisex Salon. 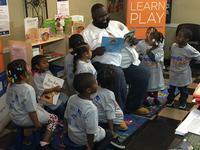 Add a Comment to Words at Play Community Partners Are Doing Great Things!